Some of the light will leave Mollie Stone’s at the end of the month. On June 30, 2009, James Calvin Moore Sr. — just James to his many admirers — will retire after 31 years at the neighborhood grocery store. “Your body tells you when to retire, not your mind,” says James, who at 66 seems as spry and chipper as always, dispensing high-fives, fist-bumps and good humor along with receipts in the store’s express line. He’ll definitely still be a local fixture, he says. He got his first job cleaning meat counters at Westlake Shopping Center through a friend of the family and has stayed in the grocery business ever since, doing some of everything — working stock, unloading trucks, sweeping out the back room — and, for most of the last three decades, working at the checkstand. After a stint with QFI, which was later acquired by Cala Foods, he came to the Grand Central Market on California near Fillmore in June 1978. “I was just lucky to be in the right place at the right time,” he says. Spend a few minutes with him on the street and it’s clear he knows everybody in the neighborhood. He keeps up a constant patter, calling out greetings to nearly every passerby. “You keeping busy this morning? But it’s inside Mollie Stone’s, in the express line — reserved at least theoretically for shoppers with fewer than a dozen items — where James has been a neighborhood fixture for as long as anyone can remember. Also on the minds of his fellow cashiers is the concern they might have to take over the express line. THE REACTION: The news that James Moore would be retiring from Mollie Stone’s at the end of June 2009 prompted an unprecedented outpouring of sadness, nostalgia and just plain say-it’s-not-so. All month long, people came by the store, some of them not to shop but just to wish him well. Many brought cards and gifts, which he stowed away on a shelf to be opened on his first official day of retirement. And all month long, James was able to bask in the glow of his many well-wishers. He even sent out copies of the June issue of the New Fillmore bearing his smiling photo on the front page to his entire Christmas card list — dozens of people including cousins, people from church and neighbors from his hometown of Stephens, Arkansas. It wasn’t until the morning of his actual last day on the job that reality hit. For all the accolades and urgings to stay, James had no second thoughts about leaving his post in the express line. “I might be looking good, but on the inside, it’s a different story,” he says. “You know, you see those old people at the drugstore buying that rubbing stuff. That’s me now — rub, rub, rub,” he says, cupping an aching knee. “And now that it’s my last day at the store, it’s going to be hard but it’s going to be good, and it’s . . . .” His voice chokes off as more tears come. I was in James’ line one afternoon…. just as I got to the front, James said… “Hold on, I’ll be right back.” No problem, but after about 3 minutes…I started to think, this isn’t like James, going AWOL from his station. I was in a bit of a hurry, and started thinking about jumping to another checkout line…. but, loyalty kept me in my place. Finally James returned, smiling and handed me a $20 bill saying …”this is yours.” I had no idea what the man was up to. “What do you mean mine?” He replied, “You dropped it the other day, so I put it in the safe.” I don’t carry a wallet…. just a wad of bills in my back pocket… so the $20 must have fallen out when I reached back. As luck would have it, the little old lady behind me in line that day need assistance with her bag… so James had come around to help her … saw my money on the floor and made the connection. Smart & honest….a wonderful guy… and he changed my life. Now I carry my wad of bills in my front pocket and always look down at the floor when I finish paying. I went through the line today and James gave me the news. I am happy for him but I will miss him. He handed me your article. I think he didn’t want me holding up the line too much with questions. But I thought I would share my experience. I moved to SF 10 years ago for residency at CPMC. I decided to get a place near the hospital and found a reasonably priced one bedroom across the street from the market. At the time, it was just me; no dog, no wife and no child. All of which I have now. I was not inspired to cook for one. In fact, my bill for the gas (gas stove) in 6 months was zero dollars! If you can relate to the meal plan cards they have in college that is basically what I had at the market. Embarrassing that even today the deli people do not need to ask for my order. They know. But on my way out there is James. He always seemed upbeat and had something positive to say no matter how long or how busy his day. We would talk about a game or the weather, nothing too heavy. I was working some tough hours then but he always made me smile and feel like I had a friend in the neighborhood. Though I have moved off California Street I still come there partly to see James. The market is not cheap, but James tips the scale. I’m going to miss him and hope he keeps his word about being around the neighborhood. When James learned I was collecting the new statehood quarters, he made a special point of always saving a couple for me and presenting them when I came through the line. Just this week he surprised me with a couple of newly minted District of Columbia quarters. I send my best wishes to James. What a delightful person! He always asked me “How are the boys?” Amazing that he never forgot me over almost 18 years. I hope his retirement is all that he wants it to be. 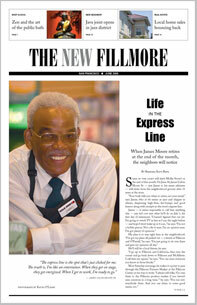 Thank you very much for the article on James, ‘Life in the express line.’ James is a great person and I have always enjoyed his charisma and smile in the express line at Mollie Stone’s. Forty-five years ago, when I was 19 years old and 9 1/2 months pregnant, I stopped into Lick’s Supermarket on Clement Street to buy groceries. As I left, a friendly busboy with a heart of gold saw me struggling with my bags and offered to walk me home. I have loved James Moore ever since — long before he came to the express line at Mollie Stone’s, even before Fillamento came and went. Enjoy your retirement!